(Fredericton) In New Brunswick, people who have an intellectual or developmental disability face rates of mental illness that are three to four times higher than the general population. People with an intellectual disability also face many risk factors for developing mental health concerns throughout their lifetime. “Front-line health and service professionals often have not received specialized training, and may not feel adequately prepared to work with or provide services to individuals with dual diagnosis,” Pike adds. Supported by an extensive literature review, the online self-study program involves a seven-module series with easy-to-read formats, embedded instructional videos, downloadable resources, review quizzes and links for digging deeper. “It’s important for those working with individuals with Intellectual disabilities to understand this population’s vulnerability to psychological stress and the development of mental health concerns,” says Dr. Patricia Peterson, a Professor of Education at UNB and associate with WMA Wellness, the organization that contributed their expertise in developing the content of the eBook. 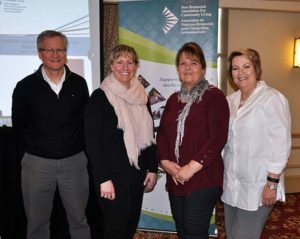 The initiative was an important one for NBACL. “Several families who we support have told us about their struggles to access adequate mental health services for their loved ones, because of the lack of knowledge by mental healthcare providers on effective treatments and approaches for persons with an intellectual disability,” says the Association’s president, Dianne Cormier Northrup. Funding for the development of Supporting People with Dual Diagnosis was provided by the Department of Health, Government of New Brunswick. NBACL is a non-profit, charitable organization, which works on behalf of children and adults with an intellectual disability and their families. Founded in 1957, NBACL has 12 local associations throughout the province of New Brunswick. For more information, contact Christy McLean, Manager of Communications (506) 453-4404, email: cmclean@nbacl.nb.ca, or visit www.nbacl.nb.ca.